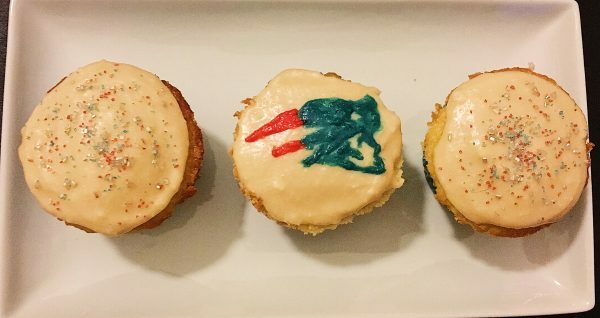 Last year I shared with you a recipe for Boston Lager cupcakes, which will still make a great Super Bowl dessert! But this year I changed it up just a little bit and incorporated a new Boston beer – Sam ’76. For both recipes, you can easily substitute in any beer you prefer. 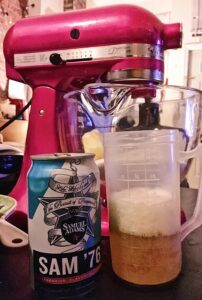 The Sam ’76 gives the cupcakes a different flavor than the Boston Lager does. Sam ’76 is also a perfect intersection between the two teams. Sam Adams is obviously a Boston beer and at one time he was a Boston human, but the beer also represents the year 1776 which was kind of a big deal in Philadelphia. So Sam Adams was in Philadelphia representing the great state of Massachusetts in 1776. It couldn’t be a more perfect beer for this Super Bowl! 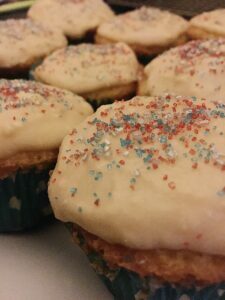 As I mentioned last year, I’m not a beer drinker, but I love the beer flavor in these cupcakes. It’s strong enough to identify the flavor of the beer, but not so strong that those who don’t like beer won’t enjoy these. They’re perfect to snack on while watching the big game, and will easily please everyone you gather with! If you decorate with red, white, and blue sprinkles, you can save your leftovers for watching the Olympics! Preheat oven to 350 F. Line cupcake pan with paper liners. Cream butter and sugar till very light and fluffy. Add eggs one at a time, incorporating after each. 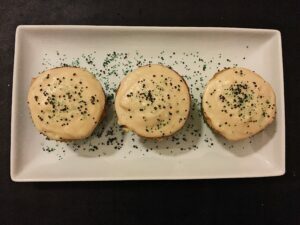 Combine the remaining dry cupcake ingredients (flour, baking powder, salt) in one bowl, and add alternating dry ingredients and beer until both are fully incorporated. Fill cupcake liners most of the way to the top and bake for 20-25 minutes, until a toothpick comes out clean and the edges are golden brown. Cool in the pan for 5 minutes, then remove to a cooling rack to cool completely. Add beer and powdered sugar and mix until well combined. If you need to thicken the icing, add more powdered sugar. If too thick, add more beer!